Volkswagen is running a television advertising campaign in New Zealand, using the bleary-eyed morning run to the shop as a way to demonstrate brand identity. Three men and two women discover that they’re out of milk for their morning coffee and tea. They drive through urban and rural settings in the Tiguan, Amarok, Golf GTI, Passat and Polo. “We’re all the same, but different”. 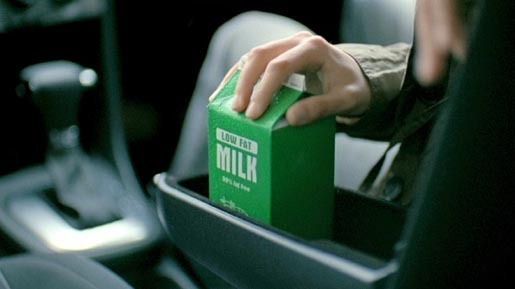 The Milk Run ad was developed at DDB, New Zealand, by executive creative director Toby Talbot, creative director Adam Kanzer, senior art director Gavin Siakimotu, senior copywriter Natalie Knight, account director Scott Wallace, executive producer Judy Thompson, agency producers Chloe Sutherland and Tania Jeram, senior account manager Joni Loggins, working with Toyota NZ marketing managers Denise Goodwin and Dean Sheed. Filming was shot by director Sam Peacocke via Robber’s Dog, with producer Anna Stuart and director of photography Ian McCarroll. Editor was Richard Learoyd. Online work was done by Paul Dickinson at Digital Post. Sound was produced at Liquid Studios. Music is “Dry” by Acetate Zero.